Country living at its best. 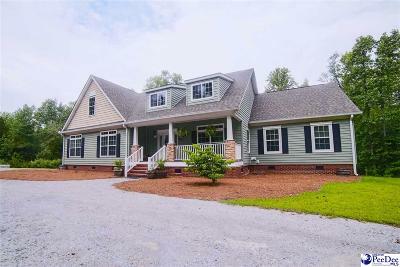 This large 5 BR, 3.5 bath home is the perfect place for family and friends. Hardwood floors in kitchen, dining room and breakfast room. Fireplace with built in book cases in Living room. Large family room off of kitchen with wet bar and half bathroom. Master bedroom is down with tray ceiling, walk-in closet, carpet. Master bath has garden tub, shower, his and hers vanity. Guest bed room and full bath down. 3 bedrooms, 1 full bath upstairs, large bonus room with hardwood floor. The bonus room is wired for 220. Laundry room and office downstairs. There is a 500 gallon propane tank and tank less water heater. Home is sitting on 11.8 acres with a view of Beaver Dam Creek from the large rear deck. The property is the perfect place to observe nature and get away from the hustle and bustle of in town living but only minutes away from downtown Hartsville. Call your realtor today.